Up to $500 value. Valid with Qualifying Purchase. Coupon must be presented at time of service. See dealer for details on models included in promotion. Expires 5-31-19. Schedule Your Heating System Maintenance today! Amber Heating & Air Conditioning designs, installs and maintains systems for the control for comfortable and healthy building environments. Our continued success depends up the quality of our materials and craftsmanship and complete integrity in our service and responsiveness to customer’s needs. For over 55 years we have been respected in the industry for the quality of our craftsmanship and our personal customer service. We feel passionately about this because we always want to be a customer’s best choice for all their comfort needs. Experience, dependability, quality craftsmanship in our services are all qualities Amber Mechanical provides our valued customers. We serve Chicago and Northwest Indiana. We offer 100% Comfort & Satisfaction Guarantee to meet our customer’s needs. 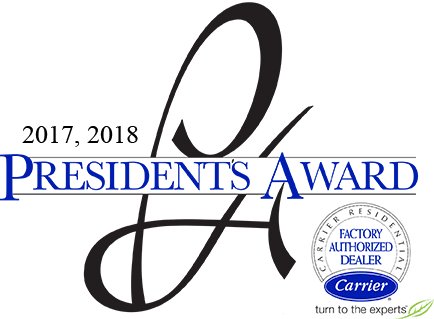 As a Carrier Factory Authorized dealer, Two time Carrier President award winner and Comfort 24-7 Provider our customer can be rest assured they are receiving the best service. With Certified service and installation technicians providing complete and professional work on every job we will get the job done right the first time. While our everyday pricing for a new AC or heater installation is always fair, we want to make equipment ownership a reality for all of our customers. On a regular basis, we run a variety of specials on the many different services and products we offer. Feel free to check back on this webpage to discover the current coupons and discounts that apply to our equipment, accessories, indoor air quality products and heating or air conditioner repair services. Financing: Buy Now, Pay Later! We offer multiple financing options to help make your HVAC upgrade more affordable. Amber Heating and Air Conditioning is your Expert Choice in Comfort. A Long Tradition of Quality Service Families and Businesses Trust. Comfort Craftsmen for Over 55 Years. 02/08/2018 Ask my kids - I trust noone. But Roy was out to my apartment building and was able to get the heat going for my tenants and me. He explained to me what he needed to do and I gave him the go ahead to order the parts needed. He made the repair as soon as he could and the heat has been working fine for us all since then. I trust Roy, and I will always call Amber and ask for Roy to come out when I have a problem with the heating or cooling! With more than 55 years of experience, Amber Heating & Air Conditioning is an industry leader in providing excellent service to residents in Chicagoland and Northwest Indiana. As Comfort Craftsmen, we are dedicated to providing quality service to homeowners and businesses, making your experience a pleasant one! We are able to provide our customers with expert advice, service and value because we keep up with the latest technology, making sure our technicians are highly trained and offer competitive pricing. At Amber, our customer-first philosophy is paramount in everything we do, ensuring quality service every time. Our team will stop at nothing to ensure you are more than satisfied. If you’re looking for an honest and professional company for all your heating, cooling and mechanical needs, call Amber Heating & Air Conditioning. We take pride in providing the right comfort solutions for your needs! Purchasing a new furnace and air conditioning system requires a great deal of thought and evaluation. The friendly professionals at Amber Heating & Air Conditioning can help direct you through the entire process so that your system continues to provide abundant comfort and efficiency through numerous years of consistent service. With more than 55 years to our credit, Chicagoland and Northwest Indiana residents know they can rely on Amber for topnotch HVAC service every time. Properly sizing HVAC equipment is the first and one of the most critical steps for a successful installation. Amber’s design consultants use industry-recognized load calculations to precisely measure a home or office’s heating and cooling requirements. These calculations take such things into account as square footage, airflow, the number of occupants, windows and more. The end result is a system that’s designed specifically to provide optimum comfort to the space it serves. Routine maintenance programs have been developed to help improve equipment performance and minimize the chance of a breakdown during harsh weather. Customers who purchase an annual maintenance plan continue to fulfill the manufacturer’s warranty conditions and enjoy a variety of additional benefits. Services include cleaning condensers, burners, blowers and heat exchangers, thorough system inspection, confirming the refrigerant level, tightening connections, lubrication and adjustment as required. When your furnace or air conditioning unit malfunctions, it should be repaired by a NATE-certified technician. On the jobsite, our techs work rapidly to find the source of the problem. Most common parts are carried on our service vehicles, so many air conditioning repairs are completed in just one visit. It can be extraordinarily frustrating to endure an HVAC equipment breakdown when the weather is severe. Some small dealers do not have sufficient resources to work on several jobs at the same time. We have always maintained a strong commitment to air conditioning service that is consistently demonstrated by our investment in training, staff, vehicles and inventory. During extreme winter weather, a dependable furnace is a necessity. Homes with elderly occupants or children are particularly reliant on the uninterrupted operation of a reliable central heating appliance. Modern furnaces contain a wide array of mechanical and electrical components that endure excessive operational stress, especially in areas that experience extreme weather like Chicagoland and Northwest Indiana. 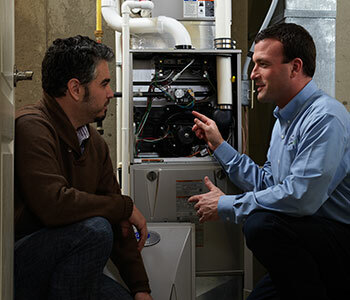 When a heating system malfunctions, it is critical to locate an HVAC contractor who is well-versed in every facet of furnace replacement and repair. At Amber Heating & Air Conditioning, we understand how unsettling an unexpected furnace breakdown can be. If the weather is very cold, the situation can easily turn into an emergency. To compound matters, contractors have their heaviest workload when the weather is unusually severe. When you need a furnace repair, our courteous representatives respond to every customer inquiry in an expedient manner. NATE certified technicians possess the training and experience to locate the source of the failure and affect the appropriate repairs. All systems are restored to total functionality, and we will never charge more than the final estimate. Most furnace malfunctions are caused by clogged filters, damaged ignition systems, broken relays and restrictions in the air distribution network. Mechanical side problems include worn bearings, a cracked heat exchanger, a burned out motor and deficient burners. Furnace service is essential for systems that are emitting unusual smells or noises since your family’s health and safety can be compromised. When operating and repair costs become excessive, homeowners may recognize the need for a furnace replacement system. The success of any furnace installation is rooted in the design phase of the project. Professional certified technicians always determine the nominal load for the entire building and each individual room. Establishing the precise heating requirements for your home or office will provide the basis for selecting the appropriate heating equipment capacity. 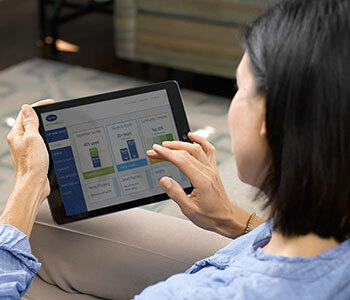 The American Society of Heating, Refrigerating and Air Conditioning Engineers (ASHRAE) developed the Fuel Utilization Efficiency (AFUE) standard in order to give consumers a simple way to compare the relative efficiency of different furnaces. The rating number is a reflection of the amount of fuel that is directly converted into usable heat energy during the burn process. For example, a furnace with a 90 AFUE rating only exhausts 10 percent of the energy it consumes in the form of waste gas. Some homeowners are still using older standing pilot furnaces that are rated at 65 AFUE or lower. These units are quite expensive to operate and contribute to environmental contamination. Upgrading to a new high-efficiency furnace can save up to 50 percent on annual fuel costs while providing superior indoor comfort. At Amber Heating & Air Conditioning, complete customer satisfaction is our only measure of success. In retrofit applications, our professional certified technicians inspect the existing duct system to locate gaps, breeches and loose connections that steal energy and create dangerous negative pressure leaks. Every new heating system is performance verified and air balanced before the job is completed. If you reside in Chicagoland or Northwest Indiana, we invite you to learn more about our full array of comprehensive HVAC services. At Amber Heating & Air Conditioning, we develop a total solution for every heating and AC challenge.